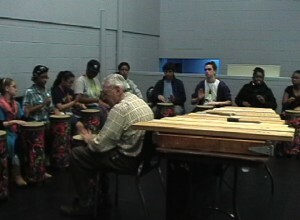 ROC Drummers is a new after school hand drumming program that is intended to provide an opportunity for young participants to experience the joy of making music, while simultaneously gaining the acquisition of valuable life skills – setting and achieving personal goals, and working with others towards common goals. The program, which began on September 23, 2015, is open to all City of Rochester grade-school students, and no prior musical experience is required. The plan is for ROC Drummers to rehearse, prepare and perform drum music derived from contemporary original and African-based sources. The ROCmusic Collaborative – modeled after the El Sistema program of Venezuela – is the host organization for this free after-school music program targeted at students in the Rochester Public schools. I’m the facilitator/director of ROC Drummers, and I have provided 20 hand drums (called, “tubanos” – made by REMO) for the program at the David F. Gantt Community Center on North Street in Rochester. 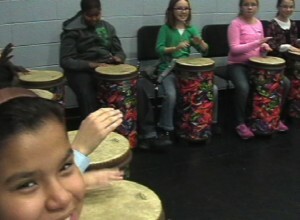 The ROC Drummers ensemble is open to any and all City grade-school students at no cost to them. The ensemble meets once every week during the school year. I helped to organize a similar after school drumming program in 2011 in conjunction with Loop Ministries at the Reformation Lutheran Church in downtown Rochester. When the Loop Ministries program was discontinued in 2015 they contacted me to seek a way to preserve the program for the 2015/16 school year. Fortunately, when ROCmusic heard about the program the organization was interested and eager to embrace it. For the first season there are 2 sessions every Wednesday afternoon – one at 4:00 pm and another at 5:00 pm. There are about 14 to 19 students in each session, and they are joined by parents and other ROCmusic faculty members on occasion. The ages range from grade school through adult, which strengthens the ensemble groups as the younger members look up to the older players, almost all of who are non-musicians with little or no prior experience in any kind of music performance. As with most groupings of young people, the biggest challenge is monitoring (if not controlling) behavior. There may be good moments/days and some not-so-good moments/days, and there is no rule-of-thumb for when either scenario might manifest itself. In general, I have found that when behavior issues appear, the best response is to play more and talk less. In any event, the challenge is to remain as positive as possible, and try to resolve the behavior issues without resorting to negative authority or “bossiness.” This is a trial-and-error process; what works one time may not work the next, and so far, being creative with responses seems to increase the chances of success. Another challenge is the wide range of abilities among the students. Some will grasp the rhythms and sounds immediately as soon as they are demonstrated, and others give the impression that any kind of connection with the rhythm – no matter how simple – is simply beyond any realm of possibility. The best strategy in the latter case is to demonstrate the rhythm for a few moments directly to the player in question, while encouraging any semblance of success with a sincere smile before moving on. The assumption is that there is value in the experience of ensemble playing, even if a particular player is in a musical world other than that of the rest of the ensemble. Somehow the music goes on, and any individual’s disconnect – whether momentary or permanent – is simply not an issue. The sessions always begin with warm-up strokes – four open strokes in each hand (where the hand bounces off the drumhead for a resonant sound) – R,R,R,R,L,L,L,L – and then four closed strokes in each hand (where the hand stops on the drumhead for a ‘dead’ sound). It’s important to remind everyone that any pain in either hand is not good, so all of the strokes must be easy and relaxed and not too hard. After a few minutes of the warm-up strokes, the ensemble turns to learning a drum piece based on rhythms found in drum music from Ghana. I first learned some of the rhythms with NEXUS in a piece from Ghana that I knew as “Damba.” The music is structured as “call-and-response,” with the leader playing specific calls and everyone else in the ensemble playing set responses. The great thing about this music is that since the responses are played in unison by everyone in the ensemble (except for the leader), the stronger ensemble players can easily carry the not-so-strong players along. In addition, the music is learned aurally and this requires that everyone listen all the time. In the second week – after the warm-ups and a review of the first section of “Damba” – we worked on the second section alone until everyone was comfortable with it, after which we combined sections one and two in multiple repetitions (1-2, 1-2, 1-2, etc.). When that reached a level of comfort, we expanded the second section. As it was played by the full ensemble, I walked around to each player individually and had them copy me, one-by-one, in playing a simple solo against the ensemble’s rhythmic pattern. In the third week – again after warm-ups and reviews – we learned the third section, in which the leader plays a short improvised rhythmic pattern combining open and closed strokes, followed by the entire ensemble replicating each rhythmic pattern as exactly as possible. Good listening is one of the positive outcomes that this section strongly encourages. When the ensemble became comfortable with section three, the next step was to play through all of the sections in performance order, with the first section of “Damba” sandwiching the other sections (e.g. 1-2-1-3-1). 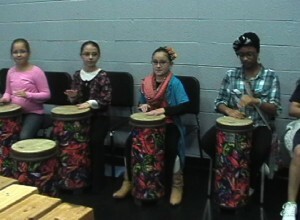 ROC Drummers is open to Rochester City School students of any age. The process continued in the fourth week with a new section of “Damba” having a rhythmic pattern that incorporates handclaps. This final section was practiced, and then it was time to play through the entire piece (e.g. 1-2-1-3-1-4-1) several times. Both groups went through the same process of learning “Damba” over the four weeks, and both groups were video recorded playing the entire piece. . The video is posted on YouTube (keywords: ROC Drummers or Bill Cahn) at https://youtu.be/Bv9SZOCUzeM. It was recorded in the Gym/Auditorium room at the Gantt Center, so there are occasional unrelated sounds coming from a basketball court on the other side of the room. The first public performance of ROC Drummers will also be in that room on October 31, 2015. The big question for ROC Drummers is “will this program make a difference in the lives of the young people who participate?” We won’t know the answer to that question for years, but obviously I and the musician educators at the ROCmusic Collaborative think that it will. Speaking from my own personal experience as a grade school student in Philadelphia in the 1950s and 1960s, I can say with some certainty that involvement with music – either as a performer or as a listener or both – can provide a foundation for personal growth though a better understanding of one’s self and of one’s connection with others. 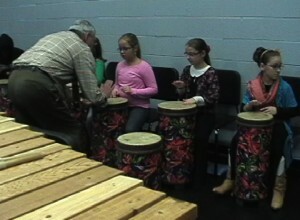 It is unfortunate that as social values have shifted, the once thriving music education programs in many public schools – with music appreciation classes, instrument lessons, and in-school performances by professional musicians available to all students – have all but disappeared, making it necessary for independent programs such as ROCmusic and ROC Drummers, though these programs cannot reach each and every grade school student, to at least bring music into the lives of a selected few. Wildly varied array of percussion music at Percussion Rochester, May 1st! Wilbraham Monson Academy, Wilbraham, Mass.